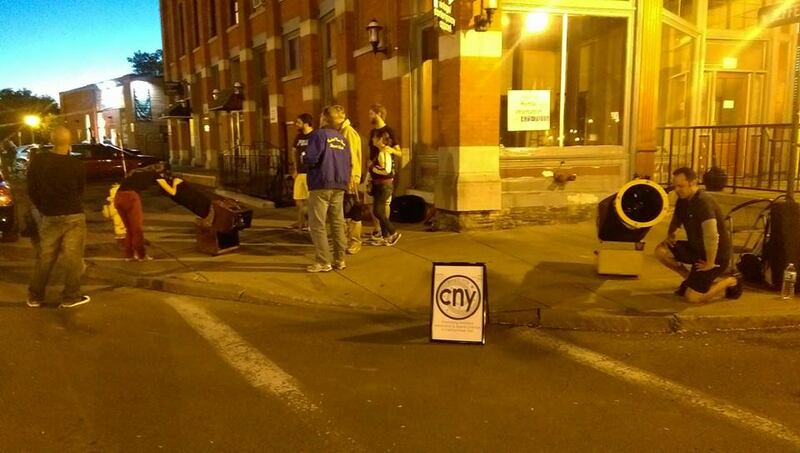 Larry Slosberg and I (Ryan Goodson) arrived at the Onondaga Creekwalk at 7:30 p.m. for the CNY edition of the International Observe The Moon Night. We quickly realized that the Moon would be obstructed by a row of large buildings, making this locale not ideal for the night. We decided to scout other locations. After a quick walk to The MOST, we found the perfect spot on the same sidewalk shared by both a vacant building under construction and the ever-trendy record store The Sound Garden. Our fear was that foot traffic would be slow, but the Moon was well positioned and slowly traversing its way over The MOST, so we decided this would be the spot. After a quick set-up (and by quick I mean lightning fast – a couple NMT’s – whadya expect? ), our earlier fear of lack-of-traffic was quickly replaced with the anxiety of too many onlookers and not enough scopes! I had set up Dan Williams’ 8” scope, and Larry was equipped with his car dwelling 12”. Thankfully, Dan Williams and Raymond Dague of the Syracuse Astronomical Society made an appearance and aided Larry and I with the part of the outreach I call the splainin’ (that’s okie for explaining). Larry was certainly the star of the show with his use of common objects to put stellar sizes in perspective. Dague and Williams both provided excellent commentary about the Moon and what turned out to be a far bigger hit – Saturn and Mars! After pointing Williams’ 8” at Saturn, the comments ranged from, “That has to be fake,” to “Get the hell outta here! I’ve never seen anything so incredible!” Since this was a night dedicated to the Moon (albeit nearly full – maybe next year we get a petition making the rounds to move the special occasion to a first quarter date), we had to go back to our lunar companion and get a few oohs and aahs from those views as well. For the reader wanting the specifics, the scope I had used was an 8” F6.5. The eyepieces used for both the Moon and the planets were a 31mm Nagler (43x magnification), a 12mm Delos (110x magnification) and for the steadiest moments I would use a 2X Celestron Ultima Barlow in conjunction with the Delos to yield that sweet spot of 222x for Saturn. Through the 8” F6.5, this view revealed the ringed planet, the Cassini Division, 4 moons, and subtle surface detail (the surface detail part probably only seen by the more experienced observers in the group). In fact, it was this view that a group of Chinese tourists seemed most excited about. 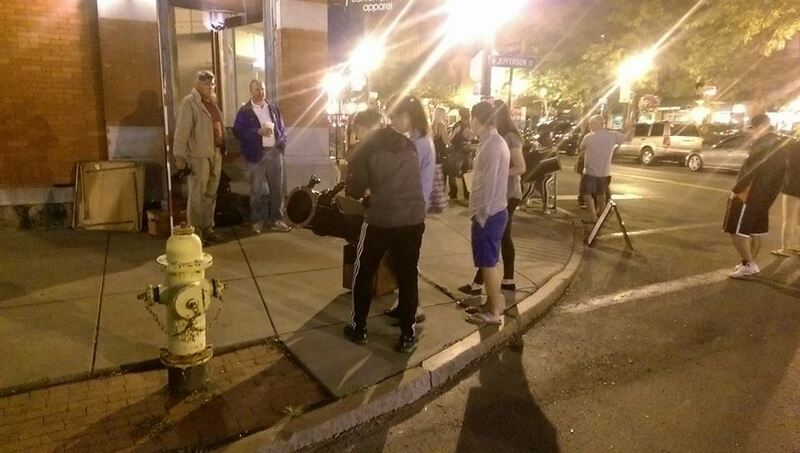 One of the last of the public onlookers to leave had stated that the night had been the most magical she can remember. The Moon was viewed through both scopes and always filtered. The views were big and bright, with most of the questions relegated to wondering about the maria and larger craters. A young college student said she was excited to finally have tidal lock splained in a way she could understand-thank you Larry Slosberg for relating information in such a candid way! Before wrapping the event up we pointed toward a number of double stars and talked a bit about the large number of planetary systems being discovered by professionals and amateurs alike. The session closed around 9:45 PM, and we went home energized and ready for the next CNYO event. An important aspect of large aperture Dobsonians (Dobs) is that the larger primary mirror requires far more time to cool down than a smaller refractor. Most of the older large Newtonians out there compound this because it was once thought that the mirror had to be relatively thick, otherwise aberrations would be introduced by the mirror cell (we now have finite computer analysis programs that will plot a perfect mirror cell of any size – most specifically David Lewis’ PLOP program). Thanks to the research of Bryan Greer (research article published in the May and June issue of Sky and Telescope) and others, we now have a better understanding of the ways larger optics shed heat. One of the more straightforward discoveries of this research was that the reason larger mirrors take so long to cool is mostly due to their thickness and not overall diameter. So if we choose the thinner mirror for faster cool down, we again shift our attention to the mirror cell. A thin mirror that is not supported properly from underneath will cause a slight deformation in the surface figure, which in turn causes light rays reflecting off the mirror’s surface to not come into focus at a single point. A star test would then readily reveal different orders of spherical aberration, degrading the view at the eyepiece. Now consider the mirror’s edge support. A sling is historically used to support the edge of large primary mirrors, often made out of Kevlar or metal banding. Through the work of Nils Olif Carlin (www.cruxis.com), we now understand that as much care should be given to choosing the proper edge support as goes into the design of the rest of the mirror cell. If this part of the mirror cell is neglected, you once again will experience different optical aberrations at the eyepiece as the telescope is moved from horizon to zenith. 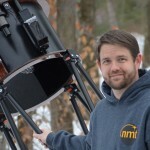 Ryan Goodson is the owner of New Moon Telescopes (www.newmoontelescopes.com), manufacturer of custom Dobsonian telescopes. He is a member of several CNY astronomy clubs, hosts observing sessions from his dark skies in West Monroe, NY, and lectures regionally on telescope building. He can be reached at ryan@newmoontelescopes.com.